Mohan is one of Umbrella’s youth in the Next Steps Youth and Education Program. He is studying in college nowadays after graduating and passing his SLC in April 2014. His 2 younger sisters stay in Gauri Shankar in Umbrella and being a close family, they meet up regularly. Mohan shares his unique perspective as a Nepali himself and an Umbrella youth living independently in the capital. 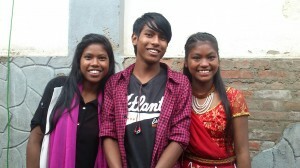 Mohan and his sisters at the Dashain Programme in 2014. Hello!! Namaste to everyone ……… Today I am going to share you all the great experience of Earthquake. It was the second biggest earthquake of Nepal. It was of 7.8 richter magnitude which came at 11:56 AM on Saturday. It was very dangerous one and very destructive. Here comes my story during Earthquake, on that day, Saturday it was my college day which starts at 6:00 AM in the morning and finishes it up at 11:00 AM. It was my luckiest day ever. I was just back from class and I was resting in my room. Suddenly, my bed started to shake and I woke up and get off from my bed but actually the whole house and the land was shaking. Everyone started to cry in loud voice say “Earthquake” “Earthquake” and I also ran away from my house and went in the open ground and everyone came there. While I was outside I saw the house were shaking, cracking and were falling down like a toy house. Near by my house, the whole family was pressed by house. It was lucky day that it was Saturday and everyone was at home with their family. Then when it stopped everyone started to search their family and other relatives. I was shocked and did not know what to do. As my sisters were in Umbrella house and I was youth and used to live outside of umbrella house. Them me and one of my friends decided to go to meet them. Them we started to run towards Umbrella house. The vehicles were stopped. So we went my running for 1 hour. On the way we say many people’s tear and many people’s poor situation. Everyone seems to be big shocked. The whole structure of Nepal was changed. After few hours we went and came to meet my sisters and they were also sitting on the ground. When I met them myself become so calm and happy to see them alright and everyone in Umbrella safe but all were scared. Then I came back to my own room. Then we all were scared to go inside the house. So we all decided to sleep outside of house in the open land and open space. Mohan (wearing red, centre photo) pictured here working together with other Umbrella youths at the Child Help Desk. We lived outside for two weeks then from Umbrella Organization Nepal, our home, I got chance to go to Rasuwa with my five friends and one staff. As I was very lucky to get chance to go to help people in Rasuwa. So, on 6th May 2015 we went to Rasuwa in the early morning. After few hours of travel we reached there. From the same day we started to work for which we were there. As our organization is related to children and work for children, we were there for the children. Our main theme was to stop children from being trafficked and to help the children from vulnerable situation. We used to aware them and request them not to send their children with new people and new place with new person. The first day was also great. We were really proud to help others. My friends were actively involved. As we were there for only 5-6 days but due the situation of Rasuwa our day extended and I was there for a month. We really learned many-many things during this one month. I learned to speak with new people, to cooperate with others and we also got chance to work with many others organizations like Red-cross, Suhara, Handicap and many lot other. On the link of UNICEF we set up big tents for Child Friendly Space, where the children can play, read and could spend there day safely. After few days, our volunteers were also added and some of girls volunteer also. We set up tents in 4-5 places. Mohan and other youths walking from village to village bringing awareness about trafficking and risks. We also used to collect data of those who have lost their parents and helpless children from other. For this we had set up “Help Desk” where people can come there and can give data and could informed us about the children who were having several problems. After that we went to search the children and get full information and support from us. This way a organization, “GOAL” was also helping us to distribute relief materials. In this way we used to go in many places of Rasuwa for a whole day to find children and aware their parents about the trafficking. Our organization was able to rescue two children who were really affected by the earthquake and had no parents to look after them. One was only 5-6 years old and another one was of 10-11 years old. We had established ‘Emergency Shelter’ where we keep the rescued children. Rasuwa was badly affected by the earthquake. We saw the bad and poor situations of children and other people. Everyone was living in tents and in other places. Some people used to get relief materials and some people were not. Due to difficult topography it was really hard to help the people of some of places. Some people were dying for help. Many people through their organizations and individually they were helping by their effort. In this way, we were able to help lots of children and families of Rasuwa. We were really feeling proud and happy to get chance to help them. We saw many helping hands from nationally and internationally. But after a month we got to come back to our room in Kathmandu because we had to go to college but I really wanted to help more. But due to lack of our time we got to come back. In this way, it was one of my great experiences in my life. But our project is still running and still helping in Rasuwa. Our helping hands never end until we die. The structure of whole Nepal got changed and badly destructed. All the natural resources, historical places, temples and many other things were destroyed. Hope everything will be normal very soon. And we all pray for it. Umbrella’s team of youths at a CFS in Rasuwa.